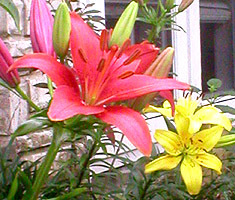 the longiflorum asiatic 'royal fantasy' lilies by the front door started blooming late last week. 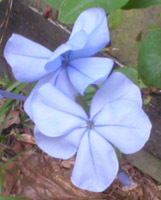 they're a wonderful contrast to the pixies by the front step. but i confess i'm a little disappointed that they are more buff than yellow. apparently i was sucked in by the catalog photo and didn't notice that the description does in fact read 'soft yellow to cream' [emphasis mine]. they're beautiful anyway. 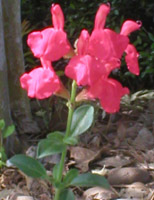 the chinese trumpet 'regale' lilies are less than happy with their situation. too much shade, i fear. they're very nearly horizontal to the ground, stretching towards the light. one has a good sized bud and i think it will bloom; i'm less certain of the others. i'll definitely relocate them, i'm just not sure when the best time is to dig them up. we've enjoyed sugar snap peas with a few meals (and straight off the vine several times), but sadly they look like they're just about done blooming, too hot already. figs are about the size of the my fingertip. not yet tempting the squirrels and birds. the two tomato plants have lots of green tomatos and blossoms, but nothing ready to eat. the peppers are just starting to bloom. i still have several to put in the ground, if i could just make up my mind where i want them. after a couple of days, three (or was it four) trips to the computer store, one fedex delivery and too many four-letter words, we are a wireless household. so now i can sit outside, admiring the plants, watching the lizards and reading the gardenweb forums. and darin can sit inside watching cnn and surfing his own sites. they aren't "real" easter lilies, but my pixie lilies are blooming for easter anyway. the first yellow opened yesterday, and the crimson started opening today. i'm very pleased with how they look. darin likes them, too. Star Jasmine and Honeysuckle. 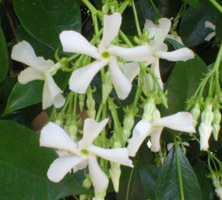 the star jasmine (trachelospermum jasminoides) is just starting to bloom between the back door and garage. only a few flowers are open yet, but the entire thing is covered with buds. you can already smell a hint of the fragrance -- it will be almost overpowering in a few more days. this is just about exactly the same date it bloomed last year. 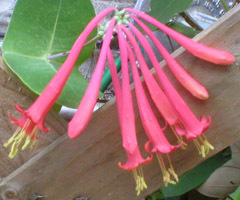 the coral honeysuckle (lonicera sempervirens) by the back door is close to blooming, too. but it has only one cluster of buds to show so far. the japanese honeysuckle next to it would be blooming right now if i weren't pinching off the tips every few days. 'Nother Gardening Blog. just spotted via my referral logs -- mimosa gardening. the "thorny tree-thing" by the garage is not a yaupon. it's a pyracantha coccinea (firethorn, appropriately enough). it's a nice enough looking tree -- great clusters of white flowers right now; later it will have bright red berries. but it has the wickedest thorns of just about any plant i've ever encountered. and it grows so much we have to prune it three or four times a year to allow access to the passenger side of our vehicles and to avoid snapping off auto antennas when we back out of the garage (replaced one antenna already).